Samsung Electronics, a global leader and award-winning innovator in consumer electronics, semiconductors and telecommunications, today announced that it won 38 prestigious International Consumer Electronics Show (CES) 2016 Innovation Awards. The Consumer Technology Association™ (CTA), the producer of CES 2016 – the global gathering place for all who thrive on the business of consumer technologies, who has been recognizing achievements in product design and engineering since 1976, has honored Samsung with one more Best of Innovation Award this year than last year. 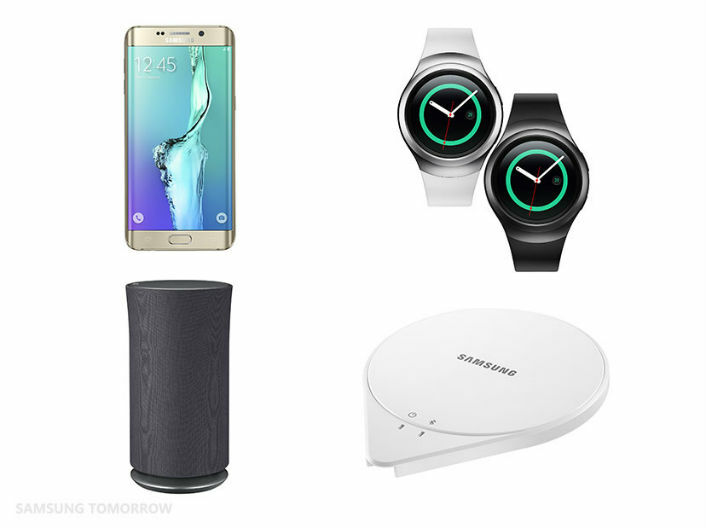 Among Samsung’s 38 CES 2016 Innovation Awards are three Best of Innovation Awards. Products entered in the CES Innovation program are judged by a pre-eminent panel of independent industrial designers, engineers and members of the trade media to honor outstanding design and engineering in cutting-edge consumer electronics products across 27 categories. Samsung’s award-winning products span 18 categories including, TV, Monitor, Mobile, Tablet, Digital Imaging, Wearable, Home Appliance and Memory. Many of Samsung’s award-winning products will be on display at CES 2016, which runs January 6-9, 2016, in Samsung booth #11906 in the Central Hall of the Las Vegas Convention Center. Some of the winning products will be showcased at Samsung’s CES press conference, scheduled for 2 p.m. on Tuesday January 5, 2016. Samsung Gear S2 – A completely re-designed smartwatch that centers on an intuitive circular design with a rotating bezel that allows users to easily and precisely navigate the UI with the turn of a dial. The Gear S2 provides at-a-glance notifications to check calendars, e-mails, send texts and more. Galaxy S6 edge+ – With an immersive, 5.7-inch dual-edge display, the Galaxy S6 edge+ breaks conventional smartphone design and delivers industry leading features, including Samsung’s most advanced camera for high quality photos and videos, fast wireless and wired charging, powerful processor and Samsung Pay. Samsung Galaxy View – Re-imagining mobile entertainment, the Galaxy View provides a movable, touchable, immersive TV experience. With a unique, video-centric user interface, the Galaxy View makes it easy to access and enjoy streaming content, interactive video games, books and other digital content. Samsung Gear VR – Powered by Oculus, the Gear VR is compatible the Samsung Galaxy Note5, Galaxy S6 edge+, Galaxy S6 and Galaxy S6 edge, leveraging each device’s Quad HD Super AMOLED display to provide the color, clarity and performance needed for an amazing virtual reality experience. ATIV Book 9 Pro – Offering a stunning 4K display, cutting-edge performance from its Intel Core i7® processor, and magnificent quad speakers, this laptop is ideal for professionals and multimedia enthusiasts alike. Samsung 950 PRO 512GB – This solid state drive (SSD), the first Non-Volatile Memory Express (NVMe) M.2 form factor SSD with vertical NAND (V-NAND) technology, is designed to meet the demands of high-performance consumer and business PCs and laptops. Ideal for projects such as computer-aided design, data analysis and engineering simulation, the 950 PRO provides users with cutting-edge performance, higher bandwidth and lower latency from their workstations, even under intensive workloads. Samsung 850 PRO 2TB – As the world’s first 2 terabyte consumer SSD, the Samsung 850 PRO 2TB is a high-performance, high-density storage device that delivers rapid data access times and program load times, as well as industry-leading power efficiency. With V-NAND technology at its core, the 850 PRO 2TB yields excellent reliability and superior performance throughout its lifetime. Samsung SleepSense Sleep Monitor – The Bluetooth and IoT-enabled Samsung SleepSense device uses a complex set of sensors in a smart, innovative, and simple way to track and provide information on your sleep habits and deliver personalized expert tips directly to consumers’ smartphones to help you take control of the most important aspects of health and wellness: how well we sleep. Samsung 128GB UFS – As the first mobile memory based on the much-anticipated Universal Flash Storage (UFS) 2.0 standard, this ultra-fast package is the highest capacity, highest performing, thinnest and smallest embedded storage memory for mobile devices. It allows for quick access to pictures from 20MP+ cameras and to 4K video files, as well as embracing 5G connectivity and delivering shorter application loading and response times. Samsung 12Gb LPDDR4 – The world’s highest density mobile DRAM chip allows for packages of up to 6GB, delivering 34.1GB/s bandwidth – three times as fast as the industry’s previous highest performing mobile DRAM. The chip can accommodate the real-time multitasking scenarios of today’s flagship smartphones and tablets having UHD displays, while providing 50% greater power efficiency and the optimal density for new high-end 64bit-system smartphones.